Burn Cottage refers to the name of a road that the 24 hectare property sits on in Central Otago. The estate was once a sheep paddock until it was purchased by Marquis Sauvage in 2002. Marquis brought on board Ted Lemon of Littorai as their winemaker and together they started planting Pinot Noir in 2003. Six years later, they released their first wine in 2009. To find suitable plots to plant on, they dug 60 soil pits and have subsequently selected ten Pinot Noir clones to plant on five different rootstocks tailored to the different soil profiles. 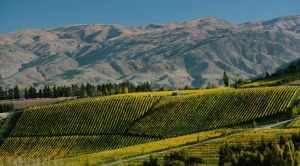 Burn Cottage has the unique distinction of being the first and only Central Otago estate that has been biodynamic since day one, Ted Lemon's one stipulation for his involvement. The winemaking at Burn Cottage also reflects biodynamic principles with low intervention.